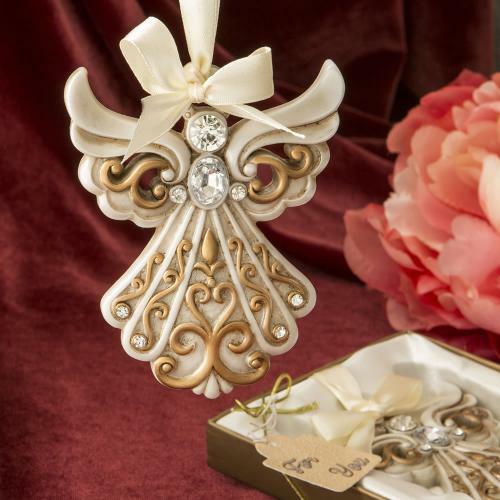 Our magnificent Angel ornament favors are ideal for christenings, baptisms, communions and other religious events. They are also perfect to bring love and joy to winter weddings! This Angel is made from sturdy poly resin and has an ornate filigree design. She is meticulously hand painted in ivory with a matte gold finish. Her face is a clear round rhinestone and a second oval rhinestone adorns her chest. A beautifully engraved halo on the head attaches to a soft ivory satin ribbon that can be used to hang up the Angel in a special place. Offer your guests the love and protection of a Guardian Angel at your next Christian religious event. They will take them home as mementos to treasure for years to come! Size 4" x 3 1/4"